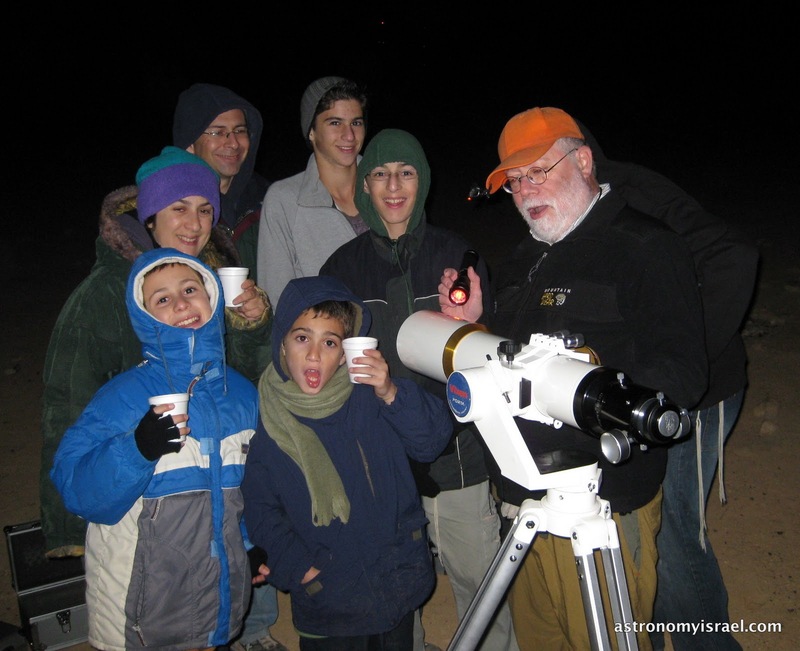 Astronomy Israel: Getting a "Crikey"! We hosted a lovely pair of families from Bet Shemesh this evening, originally from Australia and England: seven boys and two sets of parents. Alot of maleness. I don't consider my job complete until I get at least one "Wow!" from everyone. Tonight I got one better with a "Kreike" from the Australians (or was it the Brits? It was too dark to tell.)! It is a measure of how much we've lost when the first "Wow" of the evening comes from just seeing a really dark sky full of stars. It really is a "Wow" experience, now had all too rarely because of nearly ubiquitous light pollution. Even before becoming dark adapted, people looking at the sky from the dark skies around Mitzpe Ramon usually exclaim, as in "2001" (or was it "2011"? ), "It's full of stars." There was quite a bit of atmospheric scintillation, so the rising of Sirius, the brightest star in the heavens, was itself a great light show with the star twinkling almost every color of the spectrum, even green. We also saw quite a few early meteors from the Geminids, scheduled to peak on December 13-14, which may herald a good show this year, except inclement weather is being predicted for Israel then. So, what was the "Crikey" experience of the night? 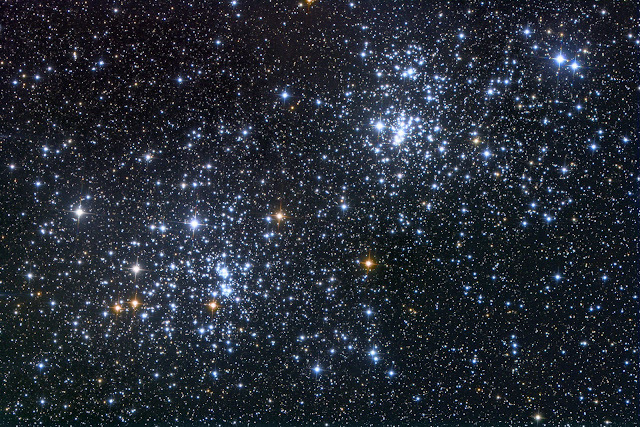 It was the Double Cluster in Perseus, my favorite deep sky cluster, with literally thousands of stars filling the eyepiece of even a small telescope. "Crikey," it's the Double Cluster in Perseus. Credit: Roth Ritter, Dark Atmospheres. We were cold and tired by the end of the evening, but I managed to round up a few of the group for this photo. Emma and Yoel captured this picture of me showing the business end of the early vintage William Optics 4" refractor to the group.